Esther Jane Williams (August 8, 1922 - June 6, 2013) was a United States competitive swimmer and 1940s and 1950s movie star. Known as "America's Mermaid," she was famous for her musical films that featured elaborate performances with swimming, diving and "water ballet," which is now known as synchronized swimming. A teenager when she did her first film, she was a three-time national swim champion who qualified for three events in the 1940 Olympics that would end up being canceled because of World War II. For more than a decade during Hollywood's Golden Age Williams was one of MGM's most bankable leading ladies. Bathing Beauty was Hollywood's first swimming movie, and it created a new genre that would be called aqua musical. It was perfectly suited to Williams' beauty and athletic skills. The film was second only to Gone with the Wind as the most successful film of 1944. In 1967, she embarked on a new career with the establishment of Esther Williams In-Ground Pools and later, a line of swimsuits based on her movie costume suits. She was the first American female to make a career as a fitness and beauty expert. In 1966, she was inducted into the International Swimming Hall of Fame and in 1997 she received the Lifetime Achievement award from the Academy of Motion Picture Arts and Sciences, the Academy Foundation, and the Museum of Modern Art. The youngest of five children, Williams was born in Los Angeles, California and was raised by her sister Maurine during the Great Depression. Her brother Stanton, a child actor, was expected to be the family's chance to get out of poverty, but he died when she was eight years old (he was 16). Williams began swimming at the Los Angeles Athletic Club (LAAC) and quickly became a distinguished competitor and set new swimming records. Within a few years she had won such events as the Women's Outdoor Nationals and the Pacific Coast Championships, and had set records for the 100- and 220-meter swims. Disappointed when the advent of World War II forced the cancellation of the 1940 Olympics in Finland, Williams cut her losses by going to work for Billy Rose's San Francisco Aquacade. She was spotted by an MGM talent scout who cast her in a supporting role in Andy Hardy's Double Life (1942). Hoping that their new discovery would surpass the popularity of 20th Century Fox's skating queen Sonja Henjie, MGM began grooming Williams for stardom, completely refashioning her third film, the modest 1944 Red Skelton comedy Mister Bride, into the technicolor spectacular Bathing Beauty. Williams began her acting career when she starred in Aquacade at the San Francisco World Fair. Her initial experience soured her taste for show business, but she was eventually persuaded to sign a major contract with MGM. MGM served as a "finishing school" for Williams, where she studied acting, singing, and dancing, as well as how to be more lady-like. Her film Bathing Beauty, was Hollywood’s first film with swimming as the main selling point and was a huge financial success. Williams immediately clicked with the public, and for the next decade she starred in one musical comedy after another, warbling the Oscar-winning tune "Baby It's Cold Outside" in Neptune's Daughter (1949) and trading steps with Gene Kelly in Take Me Out to the Ballgame (1949). As her popularity soared—she was among the top ten box office stars in 1949 and 1950—MGM went out of its way to make her swimming sequences more complex and elaborate with each new picture, freshening up the act with trapezes, hang-gliders and fiery hoops. As her films became more popular, her stunts became more dangerous. Williams did her own stunts and suffered serious injuries, including a near drowning, broken eardrums and, worst of all, a broken back. A majority of her injuries were a result of the innovative stunts she was performing and the inexperience the film crew and directors had in making an aquatic musical. During the filming of her most famous film Million Dollar Mermaid, she broke three vertebrae and was left in a full body cast for six months. Despite the excitement about her films, they became predictable as she continually played the same happy, beautiful, innocent woman. Though she won a Golden Globe in 1953 for Million Dollar Mermaid, Williams’ acting skills were limited and she was unsuccessful outside of synchronized swimming. She eventually left MGM and gave up almost three million dollars in deferred income (because she did not fulfill her contract). Her string of successes came to a halt with her last MGM release, the unsuccessful Jupiter's Darling (1955). Now a freelancer, Williams tried to gain acceptance as a dramatic actress, turning in worthwhile performances in such films as The Unguarded Moment (1956) and Raw Wind in Eden (1958), but the public wasn't buying. She returned to what she did best, starring in annual TV aquacades and acting as spokeswoman for her own swimming-pool company. She closed out her film career in 1961, shunning the spotlight for the next 15 years and devoting her time to her third husband Fernando Lamas, her children (including stepson Lorenzo Lamas) and her many business activities. She made headlines in 1974, when she sued MGM for unauthorized use of her films in the 1974 anthology, That's Entertainment. In 1994, she was one of the narrators for That's Entertainment Part III. After Fernando Lamas' death in 1982, Williams returned to the limelight, promoting such money making enterprises as a line of "modest" swimwear. Williams was married four times and had three children with her second husband, Ben Gage—Benjamin, Kimball, and Susan. Her first marriage to Leonard Kovner (1940-1944) ended in divorce because he did not want her in show business, nor did he want to have any children. Her second marriage to Ben Gage (1945-1959) suffered due to his drinking, partying, gambling, and bad investments. She was left broke and owed the IRS $750,000 in back taxes that were unknown to her until they divorced. During her marriage to Gage, Williams went through several periods of depression and had affairs with other men. Her third marriage to Fernando Lamas (1969-1982) was not much better. She was forced to give up her life as she knew it, as he became her primary concern. Until Lamas' death, Williams was forced to only see her children at Gage's home. Her children were not welcome in Lamas' home because they were proof of her having been with another man. After his death, Williams lived with her fourth husband, Edward Bell (married on October 24, 1994), in California. Williams died in her sleep on June 6, 2013, in her Los Angeles home. Esther Williams lent her name to a brand of swimming pools and a line of classic women's swimwear based on the full-cut swimsuit designs from her films. As proof of her long-reaching legacy synchronized swimming is now an Olympic event and her musicals inspired Cirque du Soleil to mount a water-themed extravaganza in Las Vegas. The synchronized swimming made popular by Williams' films became a medal event in the Olympics in 1984. The head of the International Olympic Committee during many of those years, Avery Brundage, did not consider it to be a real sport, and it was not until after his death that the Committee decided to make synchronized swimming a medal event. Williams returned to the public eye for the first time in twenty years around the time of the 1984 Los Angeles Summer Games, acting as a television commentator for synchronized swimming events and being an honored guest at many of the special events celebrating the occasion. ↑ 1.0 1.1 1.2 1.3 1.4 Esther Williams and Digby Diehl, The Million Dollar Mermaid: An Autobiography (New York: Simon & Schuster, 1999), 20. ↑ 2.0 2.1 2.2 2.3 Love Goddess, Esther Williams. Retrieved January 20, 2009. ↑ IMDB, Biography for Esther Williams. Retrieved January 20, 2009. ↑ Allmovie, Biography. Retrieved January 20, 2009. ↑ IMDB, Esther Williams (I). Retrieved May 23, 2007. ↑ Dorothy Rompalske, "Hollywood Mermaid Esther Williams," Biography 4, No. 7(2000): 76-77. ↑ Esther Williams, A Short Bio. Retrieved January 21, 2009. ↑ Sports.jrank.org, Godmother To A Sport. Retrieved January 21, 2009. Sherrow, Victoria. Encyclopedia of Women and Sports. Santa Barbara, CA: ABC-CLIO, 1996. ISBN 9780874368260. Young, Nancy K. and William H. Young. The 1950s: American Popular Culture Through History. Westport, CT: Greenwood Publishing Group, 2004. ISBN 9780313323935. Williams, Esther, and Digby Diehl. The Million Dollar Mermaid. New York, NY: Simon & Schuster, 1999. ISBN 0684852845. All links retrieved August 15, 2017. 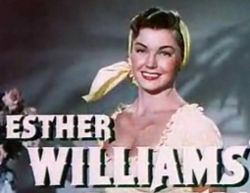 Esther Williams at Reel Classics Reelclassics.com. This page was last modified on 15 August 2017, at 15:33.